We’d love your help. Let us know what’s wrong with this preview of Earthquake! by Jerry B. Jenkins. The worst disaster the world has ever seen scatters the Young Trib Force. When the great wrath of the Lamb earthquake strikes the globe, Judd has been captured by the Global Community. Vicki is planning to distribute the Underground newspaper. Lionel tries to make it back to his friends while Ryan stays in hiding. The events foretold in the book of Revelation come to life a The worst disaster the world has ever seen scatters the Young Trib Force. When the great wrath of the Lamb earthquake strikes the globe, Judd has been captured by the Global Community. Vicki is planning to distribute the Underground newspaper. Lionel tries to make it back to his friends while Ryan stays in hiding. The events foretold in the book of Revelation come to life as the kids struggle to survive. Will the earthquake claim their lives? Will they ever be able to find each other again? To ask other readers questions about Earthquake!, please sign up. What do you predict happens after the earthquake in the book? This review has been hidden because it contains spoilers. To view it, click here. This book was pretty amazing just llike all the other books in the series that I have read. This one is the most exciting one that I have read. It is full of action suspense and it most definetly has some stuff that no one would expect coming. Everything in the books before this one leads up to the events that happen in this one. First off it started off telling me where the characters were. For example Ryan was at the house, Vicki was on the way to a phsycologist with her principle and Judd wa This book was pretty amazing just llike all the other books in the series that I have read. This one is the most exciting one that I have read. It is full of action suspense and it most definetly has some stuff that no one would expect coming. Everything in the books before this one leads up to the events that happen in this one. First off it started off telling me where the characters were. For example Ryan was at the house, Vicki was on the way to a phsycologist with her principle and Judd was on his way to jail with his friend, and so on and so forth. It started out as a normal day when out of nowhere the Earth started to shake violently. All of the kids expected it because it had been in the bible but they had no idea when it was going to happen. When the earthquake happen Judd and Vicki were on the road, but they didn't get the worst of it. Vicki and her principle were stuck on a bridge when they saw the bridge collapse and cars plummet to the ocean below. When the car fell Vicki's principle froze. Late in the story Vicki described it like "she froze like a little kid". Vicki got out of the car safe and sound but she felt guilty for having to leave the principle in the car so she went back to get her but a tree branch had pierced her skull so Vicki continued on. Judd and his friend escaped the van with their handcuffs still on though and right before they could get to the gaurd with the keys the van exploded. They realized the had no chance of getting uncuffed, but they kept going. Judd and his friend found a place to rest but right when they did a wall busted and they were swept away by a current. They found a tree to cling on to, but Judd's friend lost grip and fell into a crater. Soon after meteors started hitting the Earht and making huge holes. Ryan was stuck in the basment (which was now just mud), and he was stuck under a huge beam and water started to rushing into the room. Chaya and her father were trapped under beams of their house and they were arguing becase she changed her religion without her father knowing and he was pissed about it. Judd finally got out of the tree and the more he traveled the worse it got. He ran into a house and the people were hostile, until they figure out he was just trying to escape the "law" because they ran an underground railroad. Chaya tried her hardest to explain to her dad that they could make it out if he agreed the Jesus Christ was his savior but he wouldn't listen to her. She kept blacking out but her father couldn't reach her. Ryan was stuck for a while until he sent his dog to go get help. Two men came back and pulled him out of the basement. They took him to a make-shift hospital and he got treated there but he was told that he would be paralyzed from the waist down but otheer than that he would be alright. Vicki found a friend and they tried to look for Ryan but they looked in all the wrong places. They never found him but Ryan did send all his friends a note. At the end Chaya ended up dying with her dead Mom's broach in her hand. It's still hard to believe that Bruce is dead. Where is the leadership? With the Young Trib Force scattered, it doesn't seem like they'd have much leadership even if he were alive. Chaya tried to reach her father, and though he'd disowned her for abandoning her Jewish faith, he was obviously heart-broken over her death. Maybe that's enough make him question his beliefs. I loved the book because I am a christian and it talks about the book of Revelation and how the great Wrath of the Lamb earthquake strikes the Earth and millions of people die and only those who believe in him may survive.I thought the book was really exciting,interesting,and sad because people die but it is a great book and I cant wait to finish the next. 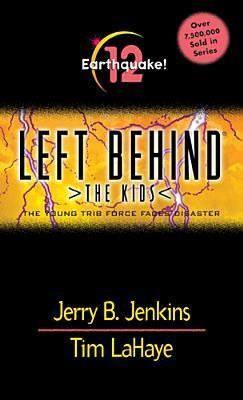 This book is about when the kid get separated from the earquakes and other major damage. I recomened this book for 10 year olds and up because there is some intenes parts in the book. many people, and main charters die in this book so be ready. As the title suggests, the ground is literally shaking throughout this twelfth entry in the series. As such, it is probably the most intense and involving volume so far. If you've read the series up to this point, you must continue with this one. Content Concerns: Disaster violence and peril, which also involves characters getting injured and possibly killed. Like I said above, it's the most intense one yet. This review has been hidden because it contains spoilers. To view it, click here. The book was thrilling and had me on the edge of my seat with every page! I didnt like when Chaya died but I still think it added a good part in the story and made me wonder what will happen to her dad. I think it was the most action out of any book so far. Really good . Lots of action . Leaves you hanging in the end . this series is one of my favorites, it has adventure and the realism of the end of the world. I really enjoyed it. I thought it went really well with the books before hand. See the first book in the series for a full review. This book was best one, I loved it.